It does not extend into the Roman period thus does not refer to the point of this thread. The point is that if the climate was warmer than now in the Roman period, ( a safe bet given the Roman growing of vines in York ), then that warming happened without the effect of increased CO2. And the present warming cannot be seen as exectional when compaired to the longer historic view. If the tree ring data which shows this Roman warm period is good(the data) then the present warm period cannot be automatically atributed to industrial activity. If the tree ring data is unreliable then the origional hockey stick data must be discounted as equally unreliable. There are other temperature data sets which do to variuos degrees show the "hockey stick" sudden warming of the period 1970-2000. Those which show this most clearly are the most massarged/corrected. I am not suficiently statistically proficient to argue the degree to which the correction is or is not justified. I read those debates and see that there is a high degree of reasonable sounding sceptisisim from people who do know what they are talking about. I also see that there is a highly emotionally driven need for other scientists to proove the case that the present warming is excetional. Whilst such drive is the basis of exploration it should not be ignored when reading the results of such scientific discovery. I think that the present warm period may well be the result of human activity but I see nothing which causes me to lose sleep over it, indeed it seems generally a good thing. The polar bears did manage to survive the Roman period after all. I wonder where people are growing wine now? 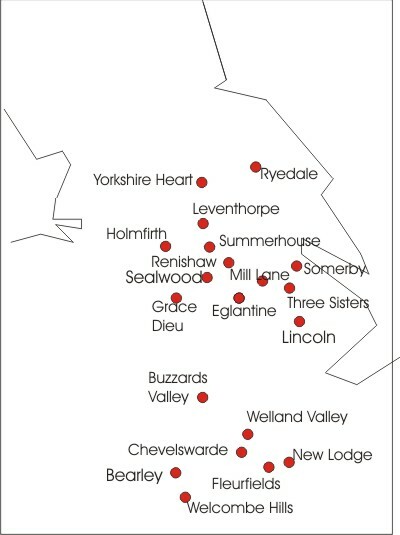 for the benefit of people not up to speed on UK geography Ryedale is very near York if it's not a district of it. Oh dear, another leaky argument from Tim the plumber. I am particularly fond of icewine for several reasons, but given the production requires a hard freeze in the process the climate required is colder than many expect. Canada and Germany are two of the major production areas for it. There is some indication the Romans also produced icewines. I'm not a big wine buff but the English wines I've tasted are very similar to German wines not icewines but Hock. Some English wines are good, others are best described as interesting. What the quality of Roman wines were we can only guess at. I do know that they often mixed wine with water. With transport in the pre-modern age that much more difficult it might have been economic to make low quality wine in large amounts near the outposts of civilization. Wine that these days would struggle to find a market. Personally I think to use English wine in an anti-global warming argument just displays ignorance. 1 English vinyards have begun to spring up in places where the Romans had them since we have had warm climate recently and also (I expect) we have more hardy varieties now. The point is that the present climate's warmth is not hotter than the Roman period. 2 My point about the temperature data being corrected is that it seems there are some questions as to the degree of reliability of such data sets. The degree to which they agree with the origional "Hockey stick" data from tree rings seems to be in proportion to the degree of correcting they have undergone. I accept that it has got warmer. The first question is the degree and if this is exceptional. The second question is; is this a problem? The third is; to what degree is it going to continue to warm and will it cause a net problem? Fourthly; What is the cost of trying to avoid it? Personally I see no significat trouble coming from a slightly warmer world and a lot of benifits from increased rainfall and fertility. In England in the last 50 years or so? We know that localized cliamate varaiations impact the globe to some degree, but do not indicate a global problem or lack thereof without the global evidence. Where is the supporting evidence that 50 years of grape production means the temperature is "not hotter" than the Roman period? The tree ring data was adjusted to merge with the instrumental data where is became available. Why would one use a proxy where actual measurements were available? Since there was no similar adjustment to the decades prior the degree of change and the exceptional nature should be self evident from the graph. Only to those seeking to maintain the status quo and anything they can use to delay action will become a "problem". That is where there is an uncertainty. The answer is a strong probability of the warming continuing and beign a net problem. Compared to the cost of not mitigating or just the single view? Personally, I doubt your expertise in making such a determination would carry any weight with anyone other than yourself and someone who wishes to believe as you do. The rest of us would look to the experts in the field for their professional opinions. Personally I don't think you knew about modern wines in York when you made that point. You realize you look a fool and you are now trying to spin your way out of this like a politician caught putting hookers on expenses. As for you other points; I don't think your being honest when you say that the data has been corrected, in fact your just making it up, Remind me; why should we listen to you? Fair point. It should have read "a safe bet it was not given the Roman growing of vines in York". The Title of this thread is "Tree rings suggest 0.6C warmer Roman world". If the world was so warm in Roman times then our present climate which is less hot than the quoted Roman temperature can not be seen as exceptional. Can not be seen as the only being possible as a result of industrial activity. The reason you should think about this is that it is the obvious conclusion of the tree ring data quoted in this thread. The fact the it is me that is pointing it out is utterly irrevelant. Yes, and the key word is "suggest" which is not a firm claim. If is also a key point, but also that the world temperature of which the paper speaks is but one reconstruction and there are others, which the paper admits, showing a different reconstruction. Unless and until there is some independent support for this new method of reconsruction there is more against it than supporting it. The obvious conclusion is this is something that needs more research at least and at worst is a waste of time. The experts in the field will be the best choice in making that determination. If this data turns out to be strong then the worries about our present warming stuation take a step backwards. If this data of the Roman period being warmer than today is true then we should not be worried by today's temperature and should be extreemly reticant about ascribing the cause of it to our activities. Not if the data only deals with a portion of the globe. As has been pointed out the US has been very hot for a while but the global temperature average is not moved as much. Regional climates do not refute global data. Wow, why use 10 words why 1000 will do. Translation; The present rate of temperature gain is unprecidented. the fear is that this will continue and will result in dangerous unprecidentedly high temperatures. Answer; The present climate is monitored much more closely than is possible for any re-constructed data such as tree rings. This will automatically result in a greater fidelity of the data which will always look more jerkey, that is greater rate of change of rate of change. The actual conditions and speed of changes may have been just as quick in the past but the process by which they have been recorded and then analysed has averaged out the data resulting in a smoother graph. May, possibly, might not be like that, it could have taken longer to change temperature. Obviously you missed the point as I explained it very economically (with exception of the puns at the end). The short form could be that the analysis of the graph data shows an unprecedented CHANGE in the way nature works so there is obviously a unique factor with a strong influence that was introduced to the system in the last few decades that was not in play for the last two millennium. The worry is the speed of the change rather then the current temperature level. If you park your car 2 feet from a brick wall, you have no worries about hitting it. If you are going highway speed and are 2 feet from a brick wall, you have something to worry about. Translation: I really do not understand what you are trying to tell me, but I will assume it is wrong because I do not wish to believe anything other than what I already understand. Answer: Ignorance is not a good basis from which to try to debate. Simple point: The measured acceleration in temperature increase is unprecedented in the known climate history. It is the sharp and sustained rise which creates the hockey stick end and which is the concern.